Before we get started, let’s recap WHERE in the questlines you need to be in order to be able to visit Friends. Chaos She-ory has to be done (Parts 1 &2) Part 2 sends you to Neighbors to see how it works. Once ALL that is done, then you get to go mess round in the Neighbors. HOW MANY ACTIONS DO I HAVE IN NEIGHBORS? Similar to previous events, you will be limited on how many times total you can tap items and earn Material as you pass through Neighbor to Neighbor. For Act One, you will have a Total of 90 Daily Actions every 24hrs. Mutant Veggies: Each one tapped pays out $, XP, FP (if you are not at MAX Level), and 1 Spade . This is essentially your “Building” tap. So NO, your Neighbor will not know you visited them and tapped on them. WHAT IF THERE IS NOTHING TO TAP? If you are seeing nothing at all when you go into a Neighbors town, it means you have already used up your 90 actions for the day and have to wait until your 24hrs resets. Once it resets, you will be able to go back in and start over. Other option is they have not updated to the proper questline completions to start the Terwilliger Event in their game. Best to check the Main Neighbor Screen (like above). If you only see zeroes on the counts, there is a good chance they are not ready for the Event. So take caution when tapping in those towns. Some of you may still be working on those Friend Point Prizes in your game, so you relied on tapping Neighbors Buildings to get the extra FP you need. For this Terwilliger Event, the Mutant Veggies are acting as Buildings. That means you will get the FP from the Mutant Veggies instead of Buildings for Act One. Here is how the Friend Points (FP) will break down daily. So for a total of 100 Neighbors tapped in a 24 hr time period you can earn 810 Friend Points. That means MAX FP Level in no time at all. That will push you to Level 16 and MAX when you complete collection for the Canyonero. Giving you TRIPLE Payout on Daily Actions and back to Random Pink Sprinklies. This is something that has been long going on in the game and a pretty cool way to earn some Free Donuts from just tapping through Neighbors. First off, you need to make sure your Friend Point (FP) Level is at MAX. The current Level now is 16. If you are at MAX FP Level, as you make your way through Neighbor Daily Actions on the Mutant Veggies, keep tapping. Don’t stop at just the 90 Actions. Depending on how many Neighbors you have, you can get anywhere from 1 up to 6 (which is most I got in one day) Free Donuts. Not bad for just tapping on through. Again, these will ONLY come from Mutant Veggie AND ONLY if you are at the MAX FP Level in your game. WHAT ABOUT VANDALISM ON THE BUILDINGS? If your Neighbor is not fully into the Event any buildings you tap Spray Paint on will trigger the Vandalism. 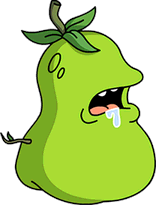 If they are fully into the Event , then you do not need to worry as you will ONLY be tapping on Mutant Veggies. Vandalism will not happen..
HOW CAN I GET MORE SPADES FROM NEIGHBORS? If you want to spend some of your Donuts to help you in getting MORE Spade from you 90 Daily Neighbor Actions, then invest in the Farming License. 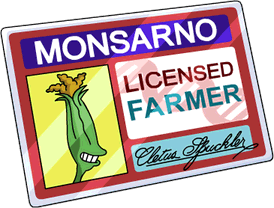 The Farming License will double ONLY your 90 Daily Neighbor Actions tapping Mutant Veggies. So with the purchase, you can get 180 Spades Daily. By clearing the Mutant Veggies in your town. There is a RARE chance one will pop up. But if you are in your town often, you can get a few each day. By spending Donuts to purchase them. (Though we always suggest to think hard before spending those sprinklies. Is it REALLY worth it to you?) These options will unlock once you complete all listed at top of this post and will remain in your Event Menu for the Terwilligers. HOW MANY MUTANT SEEDLINGS CAN I GIVE? MAX Mutant Seedlings you can Drop Off. This is the amounts you can leave when visiting and the time you have for them to be squished. So it is BETTER for you to leave the Mutant Seedlings at a Neighbors vs the OTHER Springfield. As 4hrs gives you faster payout then 24hrs. Not to mention you are limited to only 5 there vs 10 in each Neighbors. You will also be able to tell how many out of the 10 possible you can drop in their town by looking at the icon in the upper Right corner of the Neighbor Screen. WHAT BECOMES OF THE MUTANT SEEDLINGS? You may have already seen some of these guys bouncing round your town from a Neighbor already at this point. This is what the Seed turns into as soon as you drop it into your Neighbors town. Now as for squishing them, it is beneficial to BOTH of you to tap them as soon as you see them. If you wait too long, ONLY your Neighbor will benefit from leaving them there. You have 4 hrs from the time they are left to get them. Not to mention you can’t have more than 10 at a time, so clearing them fast makes room for other Neighbors to be able to drop them. WHAT IS THE PAYOUT ON THE MUTANT SEEDLINGS? In other words SQUISH THEM. This way you both get something from the drop. As far as WHAT you might get, the Spades tend to be Rare and the Corn & Fertilizer more Common. These guys usually first appear in the Sidewalk or Boardwalks of Springfield, but will quickly bounce off. Just like Sideshow Bob, they will disappear into Buildings and Decorations. So get them while you can. WHAT DO I GET FOR TAPPING ON MUTANT VEGGIES IN MY TOWN? There is NO Bank on this one, so once you reach MAX no more will spawn till you clear some out and wait another 10 mins for more to come. So roughly under 7 hours (if only 1 spawns at a time, still looking into it) you are looking at hitting your MAX of 40. They roam all over town and will hide behind Buildings and Decorations. So use your “Movement Menu” to shut down all the items but Characters, then scan your town to see if you can locate any hidden. Mutant Veggies Payout (there are 4 different ones, and so far I have seen no real pattern of one paying out better than the others). As for your 2nd item… the Corn, Fertilizer, and Mutant Seeds… the Corn & Fertilizer seemed more common. The Mutant Seeds more rare. So these totals will vary by each player, but will add some much needed Materials to your list as well as earn you MORE by giving you Mutant Seeds to drop into your Neighbors. I want to say I average the following Daily, YOUR results will vary though. The Leaderboard is back again. It is there mainly more for fun to go against your Neighbors for the top spot. You will move up and down the Leaderboard by Mutant Seedlings. Squishing them in your town, dropping them off, and having a Neighbor Squish yours. Still verifying the drops on these, will post when done. DO I HAVE TO LEAVE MONEY ON MY BUILDINGS FOR MY NEIGHBORS TO TAP? Maybe just for a bit, til weekend. Just to give your Neighbors time to Updgrade too and still have something to tap on in the meantime. Once you start to see them all switching out in the Main Neighbor Screen and showing Material counts, then feel free to clear them all. There you have the basics of Visiting Neighbors and clearing their taps in your town. 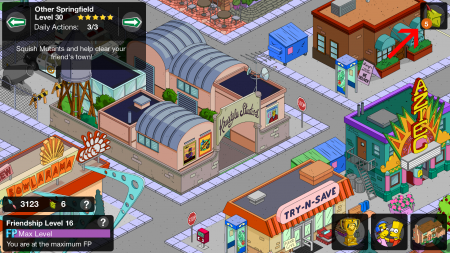 Want a bit more detail on Springfield tapping? See the MATH POST HERE. What do you think of Act One so far? Are you visiting just yet? If not, how close are you? Have you hit your FP MAX again yet? If so, any Pink Sprinklies yet? Lol. Let us know. 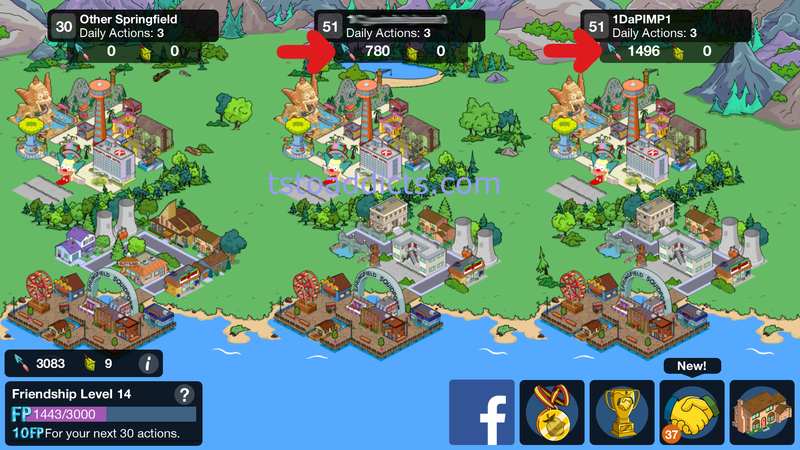 This entry was posted in Tapped Out, Tips and Tricks, Updates and tagged Daily Neighbor Actions, Farmers License, Free Donuts from Neighbors, How to get Spades from Neighbors, Mutant Seedlings, Mutant Veggies, Not getting anything from Neighbor, Spawn Rates, The Simpsons Tapped Out, TSTO Addicts, TSTO Terwilliger Event 2015, TSTO Tips and Tricks. Bookmark the permalink. Is there a post for adding neighbours for the event? I have a few neighbours who don’t seem to be participating. Do we know if the crafting prizes are going to disappear/change once act two begins??? It can’t be just me, but I’m miles away from being able to craft the farmers market, and it’s definitely not for lack of playing. I’m three days ahead of pace on the shovels, and play more than enough to have been able to craft multiples of virtually everything in events past. Should we expect the ability to collect fertilizer and corn at an exponentially higher rate in act two (and still hopefully have the farmers market available)??? Otherwise I really don’t see how the crafting prizes were realistic goals save spending a ton of donuts. The sedlings I send to my friends town do not arrive, when I got the 50 sedlings I sent 30 and my friend only got half of them. Today I sent four and none arrived, any suggestions to a solution? We have tried with logging out but it doesent help. Thanks. I was unsuccessful in finding the information my self. There is no reason to hoard mutant seedlings right? I see that some of my neighbor-eenos have upwards of 70 seedlings. Shouldn’t they be dropping them off? There’s no benefit to anybody unless they place them in other peoples towns, right? Also it seems difficult to tell who has dropped off the seed when you tap it in your town. White font, quickly moving upwards. Would like to return the favor but I miss who it is sometimes. Just my opinion. EA could have done something different with this to make it easier to reciprocate. I would be one of those with over 70. I’m hoarding them because I don’t need them just yet. The first phase is the easiest usually, so i’m saving them for when I’ll need them later. HOWEVER…if a neighbor sends me a Mutant I do return the favor and send them back, i’m just not actively sending them to all of my neighbors, only those who left them for me. so you expect them to have an alternate purpose to earning corn and fertilizer? How do you expect you will need them later? In your opinion, what is the benefit of hoarding them? Corn and Fertilizer will be used at least in Act 2 as well, so my benefit to hoarding them is Act 2 advantage. Where there will be more prizes to craft, more upgrades to complete and a new set of prizes to achieve with event currency. From my understanding, and you guys are the gurus for sure so please forgive my persistence in trying to understand, the seedlings are a means to earn more corn and fertilizer which you can just as easily hoard. Seedlings, which will have to be deposited to turn in to corn and fertilizer before it can be spent, don’t have an intrinsic value as a currency. Unless you think the pay outs will be higher in Act 2? If not, hoarding only seems to keep you corn and fertilizer poorer but it also isn’t helpful to your neighbors. In addtion, spending the seedlings earns you points on the leader boards. If you care about your ranking in relation to your neighboreenos, it seems spending now is the best way to get up the chart. But I do get hoarding resources, as a freemium player, especially corn and fertilizer. I just can’t see the advantage to hoarding the seedlings unless they will have more value in later acts. Yes…BUT Seedlings can also earn more event currency for prizes (ie spades for act 1) thus will earn you the chance for more event currency when Act 2 hits. If I don’t really need the event currency for Act 1 (i’ve basically completed the prize track) and I’m not hurting for Corn or Fertilizer…doesn’t it make more sense to hold onto them and wait for Act 2 to start to have a slight edge on prize currency? And I’m still pretty high on my leaderboard (remember, it’s going to be different for everyone) because I’m still dropping them in neighbors who are dropping them in mine (ie returning the favor). Got it. Spades might turn into something else. That’s what I was missing. And I was forgetting you get spades with the placing of seedlings, not just corn and fertilizer. Thank you. And remember…i’m still giving them to neighbors who give them to me. I’m just not throwing them all out there to the wind, make sense? What’s the advantage of holding them until act 2 if corn and fertilizer drops will remain the same? And why not use them now, since they will just be stored in your corn and fertilizer reserves anyway? Even if I wanted to “hoard” them to save for later, I must have the best, most generous neighbors because I’ve been getting seeded way more than than i am able to reciprocate. I actually feel pretty guilty that I can’t properly compensate all my neighbors in return, because I’m just not receiving enough random seed drops from my mutant veggies. So if I’m not hurting for Corn/Fertilizer (at all) and I’m nearly done with the spade prize track…why distribute them willy nilly? When i can wait till Act 2 starts and potentially get a head start on the next event currency. Remember, I’m still giving them to neighbors who give them to me….so in reality every neighbor who drops one in my town, gets at least a few back every time they do. (provided I catch it in time…) I’m just not dropping them in neighbors who aren’t giving them to me…make sense? the nomenclature of “event currency” is the key element. It is in opposition to “crafting supplies” or however else it’s referred to. Since you earn corn and fertilizer from character tasks, it’s easy to confuse corn and fertilizer as “currency” but the dynamic part is the spades (like the pies, freeze rays in the superhero event). Totally get it now. ok, that makes sense about holding them for whatever the event currency will be in act 2. but if i fairly certain i won’t have an issue earning all the act 2 prizes (like i didn’t in act 1), doesn’t it make just as much sense to use them now to rack up as many spades as possible, so i can keep hitting the donut bonus that starts once all the prizes are acquired? and i wasn’t suggesting that you should distribute them willy nilly or simply throw them to the wind. what i actually said was because i have neighbors giving me more seeds than i could reciprocate, i didn’t have any seeds to hoard anyway, basically making this a non-issue for me. perhaps you’ve been more fortunate with the random seed drops from your mutant veggies, but they have been very few and far between for me… and i check on my game every 2-4 hours. however, while i am doing the same as you, reciprocating those that gift me seeds, i don’t feel like my seeds should be used exclusively in this regard. it takes two to tango, and i don’t always wanna be the follower in that dance. so call me crazy, but sometimes i think it’s ok to go first and gift your favorite neighbors. if they can reciprocate, cool. if not, it’s all good, because i understand how this event works. Yes. Personally, I don’t go for the donut bonus, if I get it great, if not oh well. When does act 2 start? 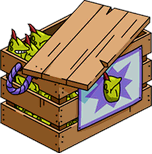 question: given that in previous events some things were carried over and/or used for the whole event, do you think itd be useful to carry our seeds to the next act if we’re close to already getting the mutant tomato pet? or should we spend them all in neighbouring towns before the end of act one? So from a math and strategy perspective… would we prefer to leave Mutant Seeds / Mutant Seedlings in the towns of our most active neighbors? Because it seems like we both earn more from them if they are tapped on (unlike a previous event or two, where we earned more if our drops to neighbors went unnoticed and so there was a bit of strategy of leaving them when we hoped our neighbors were sleeping). And if all of the above is true, are these ‘most active neighbors’ /necessarily/ the ones highest up on our leaderboards? Yes, to most active neighbors. In theory, yes on the leader-board. But could just be that they were active that day and then aren’t active for a few days after. Thanks so much for always posting helpful info! My game keeps crashing everytime I visit a neighbor. It started when i was finally able to tap mutant veggies in neighbors’ towns. Is anyone else complaining about that? May be a memory issue. Either your device and game are too full or theirs is. Try a different neighbor, if ALL of them crash on you… it is on your end. If it is just that one neighbor, it is on their end and you may have to try to boost the amount of memory available on your device to see if you can get in there or pass them over. Just started on the seedlings in other towns part…but when I go to other towns, there are large irregular black spaces throughout their towns, it doesn’t effect gameplay at all, just didn’t know if anyone else has seen this. I have been able to visit neighbors for 3 days but, I am not getting any seeds to leave for neighbors at all. What is happening? You just gotta keep tapping those veggies in your town hoping some pop out here and there. So I see it has more to do with sending, receiving and squishing seedlings – but I have done a lot more of that than him too. It doesn’t really matter, just seems odd. Only the Mutant Seedlings. How many you leave for a neighbor and how many you pop in 4 hr window. Just wanted to say thanks for the site and all the helping I read these often thanks to the three of you. I feel much better now… As far as I know, thanks to earning that 50-seed prize, I’ve now repaid every “seed debt” that I had (except for those folks whose towns were maxed out on seed deposits and two neighbors who had let me 5 or 6 seeds, but to whom I’ve only been able to repay with 3 seeds so far). So, if seeds that people have left for me disappear after 4 hours of going untapped, doors that mean if neighbors leave seeds for me while I’m asleep, I’ll never know that they left them (and, therefore, that I owe them a return favor)? I know that the game sometimes sends notifications, but those seem pretty sporadic/random… It’s not like you get a notification every time someone does something in your town. If that’s the case, then I think none of us can make any assumptions about whether our neighbors are reciprocating, or whether a particular neighbor isn’t giving us anything (unless they clearly haven’t even upgraded, or something like that). That makes me kinda sad, actually. I just wish everyone was aware of this, so at least we’d all know not to pre-judge our neighbors (and that our best efforts to repay them might end up being for naught). Do you think you guys could make this point explicit in one of your posts? (I mean, the info is all there for someone to put it together, like I just did, but a clear heads up like “You may have neighbors leaving seeds for you that you’ll never see and you may leave seeds for a neighbor that they’ll never see, so you won’t always know if you’ve been “paid back” and vice-versa” (or something better-written than that) could save people from a lot of unnecessary hard feelings! Don’t know if this is glitch or not. in the last day I have received handshakes from at least 3 neighbours who I know are well into the event. When I visit them I squish their mutants, so how/why are they able to tap on my buildings. Any thoughts ? Because they haven’t unlocked neighbor actions yet. Not a glitch, they’re just not as high as you. So I’m unable to tap the Mutant seeds I see in my neighbors town. I don’t understand how they work. You can’t tap them in their town. Only they can tap them in their own town. You can leave them for them if you want, to do that you tap the icon in the top right when in their town.